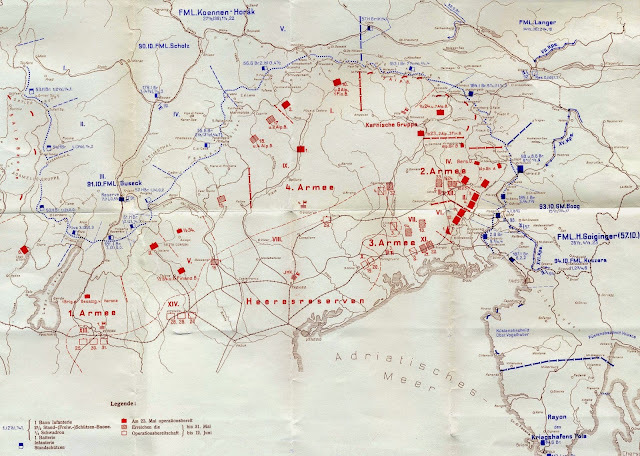 - The ongoing German offensive in Galicia, and the continued inability of the Russian army to substantially halt the enemy advance, have led to increasingly strident requests from the Russian government to France, begging the latter to intensify their efforts on the Western Front to force the Germans to redeploy divisions from the east. In response Joffre sends a message to Grand Duke Nicholas, stating that no significant German forces have moved from the west to the east in recent weeks. That is the most Joffre can offer; the ongoing Artois offensive is the most the French can go, and the Russian pressure makes the continuation of efforts there of even greater importance. - While the German 11th Army was securing its bridgehead across the San River, the Austro-Hungarian 3rd Army confronted the former Austro-Hungarian fortress of Przemysl, now a key defensive point in the Russian line. 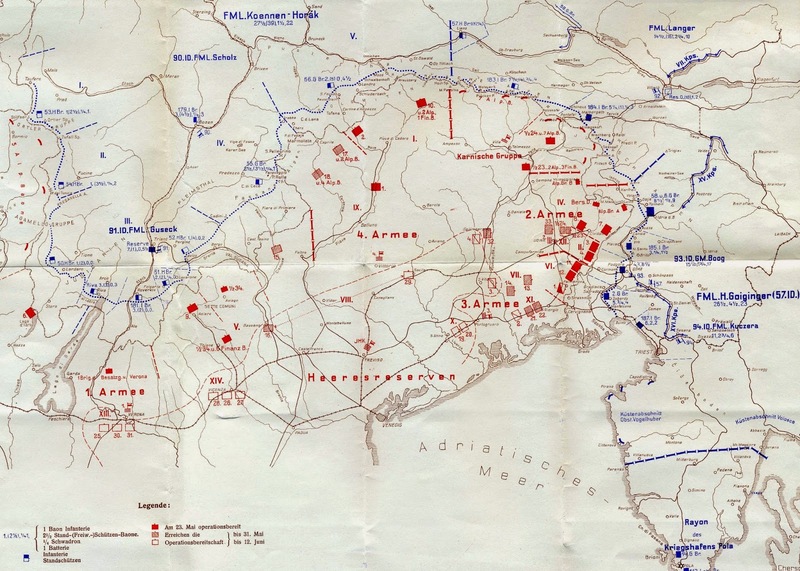 However, 3rd Army has been unable to make any substantial process against the Russian-held fortifications, nor has the Austro-Hungarian 2nd Army to the east been able to break through to the north to outflank Przemysl from the south. Thus for the offensive in Galicia to continue, the Germans will once again have to do the heavy work of breaking the Russian defence. General Mackensen's plan is for VI, XXXXI Reserve, and Guard Corps to cross the Rada River (a tributary of the San) and capture Radymno before moving further east and southeast, cutting behind Przemysl. X Corps, meanwhile, will guard the northern flank of the advance along the Lubaczowka River from Russian counterattacks. After spending several days to bring up supplies and munitions, German artillery began a preliminary bombardment of the Russian line north of Przemysl, and at 8am today the infantry advance begins. The first attack is against a bulge in the German line held by the Russian XXI Corps west of the San. Under heavy pressure from VI Corps to the north and XXXXI Reserve Corps to the south, the Russians break and fall back in disorder. Hundreds die attempting to retreat back across the San, while thousands surrender, and by noon XXXXI Corps captures Radymno. To the north, 1st Guard Division breaks through the Russian line north of Wietlin and reaches Bobrowka. The new commander of the Russian 3rd Army issues orders to III Caucasian, XXIV, and XXIX Corps to attack southwards into the flank of the advancing German 11th Army. 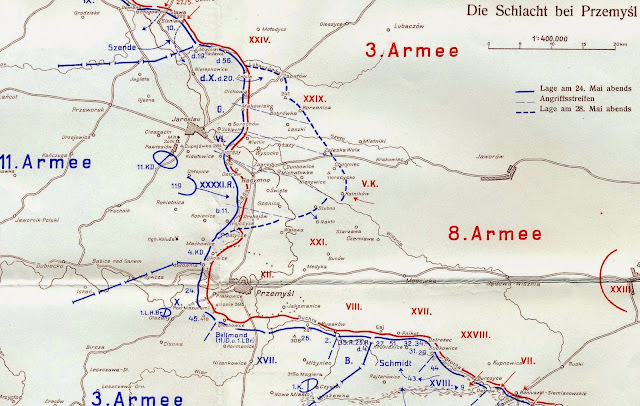 Before the orders can be executed, however, XXIX Corps is itself outflanked by the advancing German Guard Corps, and is forced to fall back northwards across the Lubaczowka. Overall the renewal of the German assault has seen the Russian 3rd Army battered yet again, as the Germans take 21 000 prisoners today. The advance of the German 11th Army north of Przemysl, May 24th to 28th, 1915. Meanwhile, on the first day of fighting on the Italian Front, General Luigi Cadorna, chief of staff of the Italian army, begins to implement his plan for the invasion of Austria-Hungary. His primary advance is to be undertaken by 2nd and 3rd Armies, moving east along the northern coast of the Adriatic Sea. Their first objective is to secure the Isonzo River and vital mountains of the Julian Alps, before a further advance towards Trieste and beyond. Along the northern portion of the Italian Front, the 1st and 4th Armies are aligned against Trentino and the Tyrol, and are to secure important high ground in order to better hold the line. However, the lack of information from the government regarding when the war was to begin has impaired Cadorna's preparations, and the Italian army is hardly a model of effective organization to begin with. By today less than half of the supplies necessary have actually reached the front. Thus the first day of the war for Italy sees only halting movement towards the enemy frontier. As for the Austro-Hungarians, Conrad, along with the Emperor and much of the government, are incensed at the supposed betrayal of their former ally. Conrad for weeks has desired to launch a major offensive against Italy upon its entry into the war, largely as a punishment expedition that would shatter Italian morale; indeed, Conrad has argued for the suspension of operations in Galicia to ensure the transfer of sufficient forces to the Italian Front. To Falkenhayn this is sheer madness, as nothing that can be effectively accomplished against Italy could compensate for the lost opportunity for a great victory over the Russians. The German chief of staff has thus refused not only to send German divisions to the Italian Front, but also to replace Austro-Hungarian divisions on the Eastern Front sent to the Alps. As a result of Falkenhayn's refusal, Conrad has begrudgingly abandoned plans to attack Italy. Instead, those forces assembling on the Italian frontier, mainly augmented by divisions drawn from the Serbian Front, are ordered to adopt defensive positions, especially along the Isonzo River, a decision of monumental importance in the years to come. The Italian Front, May 24th, 1915. At sea, while the Italian navy shows as much initiative and foresight as the army does, the Austro-Hungarians are eager to get in the first strike. At 8pm yesterday evening the fleet sailed from its anchorage at Pola, and at dawn bombardment Ancona and other points along the northern Italian coast, targeting port facilities, railway bridges, and other strategic objectives. The Italian fleet is caught napping, and regardless its main fleet is far to the south. The only naval combat sees the old Italian destroyer Turbine sunk by the light cruiser Helgoland and two destroyers off Pelagosa. Simultaneously, several Austro-Hungarian aircraft arrive in the skies above Venice and drop a number of bombs. By noon the Austro-Hungarian fleet is back in port, having struck the first blow at sea without loss. - Word of the massacres of Armenians in eastern Anatolia has reached the outside world, and further details have come to light since the Russian occupation of Van on the 20th. Confronting growing evidence of a systemic campaign of annihilation, the governments of the Entente powers issue a public statement today, stating that the leadership of the Ottoman Empire will be held to account after the war for their role in the mass murder of Armenians.